What’s to be learned from PwC’s 2014 Patent Litigation Survey that we don’t already know? Patent suits are at an all-time high, with almost 6,500 in 2013 keeping pace with the number of utility patents granted, about 300,000. Most of the new cases (67%), have been brought by NPEs or those without significant operating revenue. Median damages are still down over years past, and significant damages awards are being appealed – and reduced or thrown out – in record numbers. Is PwC revealing a bleaker picture or a brighter one? It depends whom you ask, and how they believe new developments are likely to play out. The PwC Study does not discuss that the vast majority of cases that settle and are profitable, albeit more costly, for those who enforce quality patents. Because it is sometimes difficult to separate the nuisance suits from the legitimate ones, the study provides no data or analysis about patent quality. The sheer number of suits and uncertainty about patent quality and, in turn, damages has created an environment strangely conducive (or maybe the word should read coercive) to settlement. Reading between the lines, it appears that patent quality matters more today than in the past, and respect for patents appears to be increasing. Still, the value of the best patents is being reduced by the attitude toward great patents and big awards, which, basically, don’t matter, unless a court says they do. We should be mindful that different patent holders use patents in diverse ways and have expectations that differ widely. More than ever, patent enforcement is for those holders who are very serious about what they own, but also are well-capitalized and patient. It may take five or more years to see a dime, if they see any money at all. NPEs filing more suits for two primary reasons: (1) the joinder provisions in the American Invents Act makes it difficult to file against multiple defendants in a single suit, and (2) most technology defendants will not even discuss a license unless a suit is filed first. 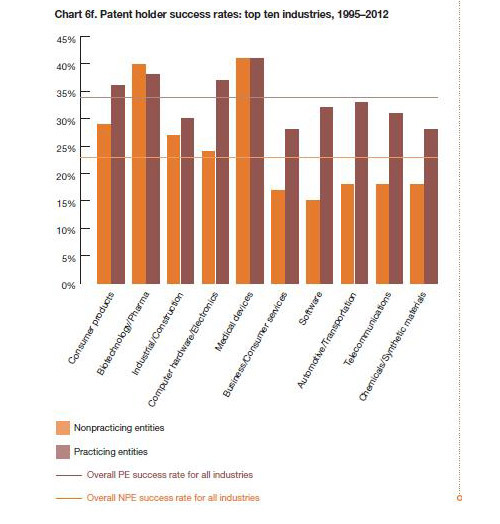 I could not find this in this year’s study the NPE vs. PE success rate in given industries. Last year (fig. 6f, at left) PEs dominated in software, telecom and automotive. There are good reasons for that I suppose, including the difficulty for NPEs to prevail in on some arts. It may have been suggested to PwC that it not encourage any unnecessary licensing or litigation activity. The PwC study found that about 71 percent of district court patent decisions are appealed to the USPTO’s Patent Trial & Appeals Board (PTAB), usually on multiple grounds. Of these appeals, 64 percent received a reasoned opinion, 11 percent concluded with a summary affirmation and the remaining 25 percent were dismissed, settled or are pending. Additionally, reports IP Law 360, 65 percent of the cases decided by the Federal Circuit received a mixed decision on the multiple issues typically raised, while 11 percent were reversed, vacated or remanded. Only 24 percent of lower court decisions that were appealed were affirmed in total — meaning that over three-quarters of Federal Circuit decisions modified a lower court’s ruling in some manner, according to the report. 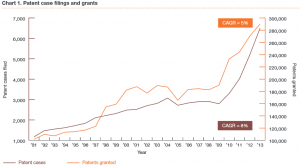 Patent trials have remained virtually flat over the past twenty years, with approximately 125 per year. Given the amount of innovation produced, products sold and disputes filed, its remarkable the number is not much higher. Click here for the full 2014 PwC Patent Litigation Study. Particularly, the rising number of litigations brought up by NPEs (67%) would be a bothersome revelation to the inventors and start-ups out there.